I was privileged to meet Pearl Cornioley (nee Witherington), one of the outstanding female secret agents of World War Two, in May 2007, just nine months before her passing. She was 92 when we met, at her retirement home at Chateauvieux, near St Aignan, a short train ride from Tours in central France. I had little trouble in detecting the force of personality that had allowed her to talk her way into the SOE, one of Britain’s most secret organizations, in 1943, parachute at age 29 from the dangerously low height of 300 feet into France a few months later, and lead over 1,000 French resistance fighters against the Nazis in the days and weeks after D-Day. No wonder the German occupiers are said to have put a one million franc bounty on her head — though Mme Cornioley, a stickler for accuracy, insisted to me that she had no direct proof of that. Mme Cornioley didn’t suffer fools gladly, and didn’t much care for journalists, saying they always sought to romanticize or sensationalize things. She only accepted to meet me on the recommendation of a mutual acquaintance. Once I’d shown I had done my homework, though, she revealed a conspiratorial sense of humour and a bottomless fund of stories — for example, what it felt like to make that parachute jump into wartime France in September 1943, narrowly missing two lakes and an array of high-tension power lines, to meet up with her boss and former school friend Maurice Southgate, the head of SOE’s Stationer resistance network. To hear Mme Cornioley telling me about that jump, click here. For months she criss-crossed France as a courier for Southgate, often on freezing night trains, using a cover identity as a sales representative for a cosmetics firm. On one occasion, she said, she was almost strangled by a suspicious fellow resistance leader after meeting up without the correct passwords. 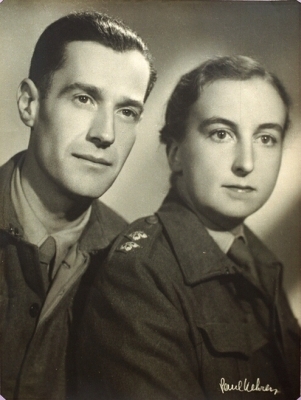 After Southgate’s arrest by the Gestapo in May 1944, Pearl Witherington, as she then was, became head of a new resistance network, designated “Wrestler” after her SOE codename. Men under her command interrupted the Paris-Bordeaux train line more than 800 times in the month after D-Day, attacked Nazi convoys and cut communications lines in a successful effort to tie down and harass German troops trying to reach Normandy. Among those she worked with was Henri Cornioley, her pre-war fiance, who had escaped from a Nazi prison camp and joined the resistance. Despite at least one direct Nazi attack on their rural headquaters — which she said Henri initially refused to believe was happening, because it was a Sunday — she and her fiance survived to marry after the war. Mme Cornioley was offered a civilian decoration, an MBE, after the war, which she turned down on grounds that she had “done nothing civil”. She was most vexed, though, by the British authorities’ refusal to grant her parachute wings. Whether it was due to prejudice or a desire to keep women’s roles in SOE activities secret, female agents did only three practice jumps before their operational drop — giving them one jump fewer than the five required to qualify for wings. The Royal Air Force eventually remedied the oversight, granting Mme Cornioley her wings in 2006. Click here for a BBC report on the award. Mme Cornioley died on February 24 2008, and was the subject of many glowing obituaries, including this one in London’s The Independent. What is The Secret Fire? What is The Malice Box?